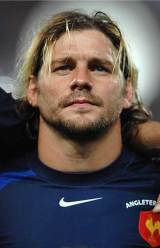 Fleet footed winger Cedric Heymans began his international career in 2000, when he made his France debut as a replacement against Italy in the Six Nations. Having begun his career at Brive, where he was a Heineken Cup winner in 1997, Heymans made the switch to Agen in time for the 1997/8 French championship. He subsequently jumped ship to French giants Toulouse in the late 1990s, where he has found a great deal of success after nailing down a starting berth with the side. Possessing great pace and a knack for finding incisive running angles, Heymans nevertheless made a slow start to his international career. Having played against Romania in Bucharest in 2000, Heymans would have to wait until June 2002 for his next international appearance against Australia in Sydney. Heymans would notch his first international try later that winter, as France beat South Africa 30-10 at the Stade Velodrome. Also later that season Heymans would claim his second Heineken Cup winner's medal as Toulouse beat Perpigan 22-17. In 2004 Heymans would add a further four international caps to his name, including one in France's 27-14 victory over Australia at the Stade de France. He then played in his third Heineken Cup final in 2004, but his Toulouse side were edged out 27-20 by Lawrence Dallaglio and Wasps. Heymans was included in the French Six Nations squad for the first time in 2005, earning caps against Ireland and Italy as France finished second in the championship. In the 2005 Heineken Cup final against Stade Francais, Heymans became the first triple winner of European rugby's top prize when Frederic Michalak's drop goal gave Toulouse the extra time win. The following season Heymans was a part of the French squad that won the 2006 Six Nations championship, playing tests against Scotland, Ireland and Wales, scoring a brace against the Irish. He would continue this try scoring form into the autumn of 2006, touching down against both the All Blacks and the Springboks at the Stade de France. The 2007 Six Nations saw Heymans most active involvement in a campaign. He played four of five tests and scored against Scotland and Italy before being selected for the French squad at the 2007 World Cup. Heymans was controversially switched to fullback by Coach Bernard Laporte for the opening game against Argentina and his inexperience was exploited by Argentinean outside-half Juan Martin Hernandez, who bombarded the French back three with high balls. Heymans was immediately switched back to the wing for the rest of the tournament, where France made the semi finals. The 2008 Six Nations saw Heymans back at fullback, although a try scoring performance against Ireland in tandem with Vincent Clerc suggested that he may have a future in the position, where he later became a regular at club level. In May 2008 Heymans became the first man to play in five Heineken Cup finals, but his fourth medal escaped him as Munster defeated Toulouse in Cardiff. Two years later, at the Stade de France, he bagged that elusive fourth title as Toulouse defeated Biarritz. Heymans, however, had to wait nearly two years for his next France cap following his appearance against New Zealand in Marseille in November 2009. He shone for Toulouse on the club scene and was an integral part of the side which took the 2011 Top 14 title. Heymans earned his recall to the national side - before which he announced he would join Bayonne for the 2011-12 season - in time for the World Cup.